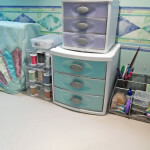 W hether your sewing area is small or large, it’s a good idea to keep it organized. In this two-part article, we’ll look at the three pieces of furniture that are essential for a sewing room. We’ll also devise a floor plan, and look at how to organize your fabric, tools, and supplies.